After seeing a Bernese Mountain Dog for the first time 4 years ago, and doing a lot of research, we knew this was the perfect breed for us. Now we had to find the perfect breeder. We knew we had to be picky to find the best breeder out there. We found Lakebreeze Palisades right in our hometown of Manitowoc. After talking to and meeting Chanda and Craig, our search for the perfect breeder was over. 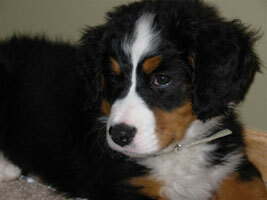 Not only were Chanda and Craig very knowledgeable of Berners, their Berners fit the breed standards perfectly. The Holschbach family made us feel comfortable and confident in their breeding program. When we picked Denali out at 2 weeks old, we knew that she would be in loving hands and receive excellent care until she came home with us. When we had questions about Nali before and after bringing her home, Chanda and Craig were more than happy to answer our questions. Nali brings so much joy to our lives! We love her to pieces! We now know that we will always have a Berner in our house. Without a doubt, we will be going back to Lakebreeze Palisades for our next Berner. We can't say enough positive things about Lakebreeze Palisades. If anyone has a question about where to get their puppy from, we highly recommend Lakebreeze Palisades. Thank you Chanda and Craig for our perfect little girl, Nali! 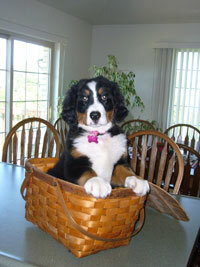 When our Berner Ella passed away last year we were all so sad, it became so quiet in our house. When spring came and we were ready for a new puppy we looked at many other breeds, but none of them were right for our family. 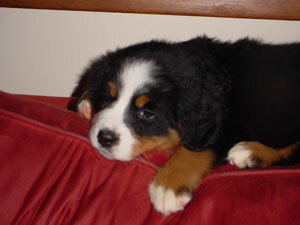 We knew that we wanted another Bernese Mountain Dog. The perfect puppy found her way from Manitowoc, Wisconsin to Maple Grove, Minnesota. We found Chanda and Craig through our pups sire's owner. From the first time we spoke to Craig on the phone to the time we picked Brea Belvedere up it was a wonderful experience. Brea is an incrediably playful, curious, and very loving puppy. Her temperment is great, she enjoys playing with other dogs and being around people and children. Both our boys played baseball this summer and she went to almost every game and practice with us, she LOVED the attention from everyone. She has been very easy to housebrake and obediance train. Brea has brought much fun, love and joy into our home. We thank the Holschbach family for loving her the way they did for the first nine weeks of her life. She is an awesome puppy! Being the proud owner of three pure bred dogs, we have had some past experience with other kennels. There was no comparison to dealing with Lakebreeze Palisades and the Holschbach family on a personal and professional level. Craig and Chanda have an outstanding breeding program, have the perfect setting for raising Bernese Mountain Dogs and have a great passion and love for maintaining a high quality and standard of the breed. Grace was a perfect addition to our family and she “had us at hello”. This is our second Berner and is she is maturing beautifully. She is healthy, sound, personable and checks out under all circumstances. I could not imagine having a ‘picnic without Grace’.